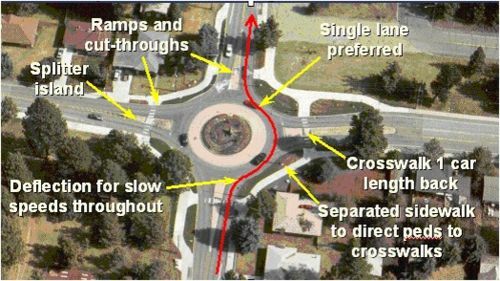 Important roundabout design features for pedestrian safety and access are shown in Figure 642.5. Most pedestrians can look for a gap and cross one leg at a time in single lane roundabouts. However, all roundabouts pose problems for visually impaired pedestrians because crosswalk locations are not apparent and circulating traffic masks the sound cues that visually impaired pedestrians use to analyze crossings. Provide audible or tactile cues to indicate crossing location. Provide good sight distances between pedestrians and motorists. Set sidewalks back to guide users to the crosswalks. For more information on roundabouts refer to EPG 233.3 Roundabouts. This page was last modified on 5 April 2010, at 08:15.